Enjoy delicious New England meals no matter where you live when you order seafood online from the East Coast Gourmet catalog. Choose form their mouthwatering seafood delivery choices. New England and Manhattan Clam Chowder -- You'll never eat grocery store chowder again once you buy clam chowder online from East Coast Gourmet. Thick with tender clams and hearty vegetables, each bowlful is like an instant trip to the coast of Maine. Rich lobster bisque -- Made with the freshest Maine lobsters, thick cream and sherry, their lobster bisque is the perfect winter treat with your complete lobster meal or just a loaf of bread and glass of wine. When you buy lobster bisque online from the East Coast Gourmet, you'll experience one of Maine's most delicious delicacies. Order some for yourself, and send some to a far away friend just to say you're thinking of them. They'll be glad you did. Complete lobster dinner -- Imagine receiving fresh Maine live lobster, thick chowder and Harbor Sweets chocolates, shipped directly from the cold waters of Maine to your front door. When you order fresh seafood online, your meal is shipped overnight for the freshest taste. Order a romantic dinner for two, or send them as the ultimate gourmet food Christmas gifts for the special people on your gift list. The best crabcakes -- Made in the traditional Maryland style with lump crabmeat, when you buy crabcakes online from the East Coast Gourmet, you'll enjoy each spicy, tasty mouthful. Like all the gourmet seafood they offer, their crab cakes are shipped chilled from their kitchens to yours, for the freshest tasting crabcakes this side of Baltimore. When you order seafood online, you expect the freshest, most flavorful seafood available. 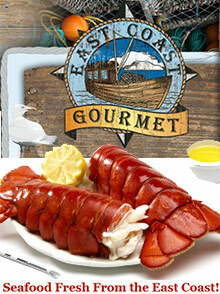 East Coast Gourmet is committed to offering fresh seafood online. And because they know that time is essential for all fresh foods, they are experts in overnight seafood delivery. Whether you send a complete lobster dinner or just buy clam chowder online, they guarantee your satisfaction with each and every product they offer.